Although school has started back up, well at least for most of us, there is still plenty of summer left! There's time to take that fun weekend trip, to go to the lake, or to go camping! Personally camping is one of the best parts of summer! I love going to the mountains, away from all of the noise, and just enjoying nature. I don't like getting ready to camp though or cleaning up from camping. If you feel like me then these wonderful camping hacks can be a life saver! 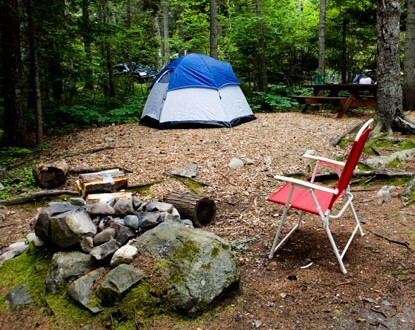 Take a look at the list of tips and tricks below and hopefully some of them will help you on your last camping trip of the summer! Hate sleeping on rocks? Try blow up mattresses! They don't take up much room in the car and they can easily be blown up! Save room by rolling your clothes. You can even roll an entire outfit up, secure it with a rubber band and then grab it when you're ready. Everything is all together! Instead of buying bags of ice, use frozen bottles and jugs of water. They're a great way to keep things frozen and then when they melt you can drink them! Don't throw away your dryer lint! Save it, put it into an egg carton and then drip wax on top. You've just created fire-starters! They'll even start a fire in the rain! Keep your toilet paper clean by storing it in an empty coffee canister! If you have small children pack activity bags for when fishing, or downtime. Fill them with coloring books, crayons, and other fun activities! Plan a scavenger hunt/nature hike for the family. If you don't like food prep, try scrambling eggs beforehand and then just pour them out into the skillet when ready to eat! To make the ground softer by using foam floor tiles, plus they're easy to pick up! Don't have a lantern? All you need is a gallon of water, and a head lamp. Point the head lamp into the jug of water and you'll be able to light up your whole tent! If you want a fun light try adding some Mountain Dew, baking soda and peroxide together. It'll glow like crazy! Stay away from the poison ivy and other poisonous plants! To avoid bringing home a tick, use a mixture of 1 part tea tree oil to 2 parts water into a spray bottle and spray your socks, shoes, and pant cuffs. Glue sandpaper to the top of your match holder so you'll always have a way to light them. Need to bring some spices camping? Try storing them in empty Tic-Tac holders. Want to snuggle with someone special? Invest in a two person sleeping bag. You can use an empty laundry detergent dispenser as a portable hand washing station. All you need to do is wash it out and fill it up with water. Don't forget the soap! Need to hang things up? Try using a belt and hooks to tie things up. Just put the belt around a tree and hang the hooks from it. Use an old prescription bottle as a mini first-aid kit. You can put aspirin, Band-Aids, anti-biotic and all other necessary things in it and carry it in your pocket. Use pre-made pancake mix to save time prepping. If you forgot the kindling and can't find any, use Doritos. Who knew Doritos would be good for starting fires and snacking? Hate mosquitos? Add bundles of sage to a campfire to keep them away! Another great fire starter is cotton pads dipped in wax. Make pizzas using your sandwich/pie iron and biscuit dough. You can also use bread, trust me these are delicious. Line the pie iron with aluminum foil for easy clean up! Try Oreo s'mores! Works just like a classic s'more just replace the graham cracker with an Oreo! Instant grits will help keep the ants away from your campsite! You can use your deodorant to help stop mosquito bite itches and you'll smell good! You can use Baby Creamy Oil as a mosquito repellent. Keep track of all your cooking supplies in a shoe organizer. This also keeps them off of the ground. Keep the kids entertained by letting them doodle on rocks! If you want something sweet, try putting refrigerated cinnamon roll dough in to orange rinds and cook over the campfire. Yummy! I hope these tips help you! If you have any camping advice or stories feel free to share them in the comments section below!